using only the highest quality Giclée printing techniques. Now you can have your very own Landscape Quilt Art Print by Nancy Zieman—enjoy in your home or give as a gift. To purchase your Landscape Quilt Canvas Print Reproduction of Landscape Quilt Artwork by Nancy Zieman, please mail the completed order form and check or money order to Nancy Zieman Productions, LLC. Print the Order Form—and Order Today! You will receive a certificate of authenticity with each purchase of Original Giclée Canvas Print Reproduction of Artwork by Nancy Zieman. Each print is made expressly for you. Please allow up to six weeks for delivery. For a chance to win a set of eight Landscape Quilt Note Cards by Nancy Zieman, please leave a comment below and tell us which Original Giclée Canvas Print Reproduction of Artwork by Nancy Zieman is your favorite. The randomly selected winner of a Clover’s Trace ‘n Create Quilt Template—Dresden Collection by Nancy Zieman is Karen Tucker. Her comment is: I love Dresden Plate designs. Some day, I will get to make several small wall hangings from my late son’s ties! His children will appreciate the memory of their father who died entirely too young in a major tragedy. 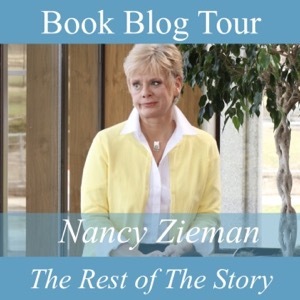 Please join us, today, for the final day of The Nancy Zieman—The Rest of the Story Book Blog Tour with a few of Nancy’s friends. View the Schedule of Blog Postings, read book reviews and insights from featured bloggers, and sign up for book giveaways! The works of art are all stunniing, but Moon Lit Birches captures the tranquility of a quiet winter day. Being a Bells Palsy warrior myself I enjoy watching her show on create TV. She was a strong amazing woman. And I love the front porch artwork as thats my dream porch for my guest cabin. I won Front Porch at an ASG event a few years ago. I had it framed and has been hanging in my bedroom. It is beautiful and I love Nancy’s work. They are all beautiful, but Front Porch is my favorite. So hard to choose! They are all stunning, but Peak Color is my favorite. Nancy was so talented and a wonderful teacher. How stunning all of these landscape quilts are! My favorite is ‘Peak Color’. Oh, how I would LOVE to learn how to make a landscape quilt–I just don’t seem to have an eye for it. 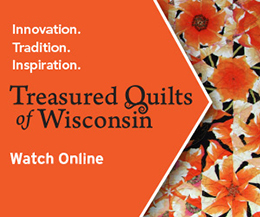 The quilts that were pictured in Nancy’s ‘Seams Unlikely’ book were gorgeous! What a VERY special person she was and truly God’s gift to the sewing/quilting/embroidery community! Peak color is my favorite! My 2 favorites are Out on a Limb and Front Porch. What a talented lady Nancy was and a real loss to the sewing industry. Peak is my favorite and then the out on a limb. Her technique for landscape was always so easy, but it said what the person wanted to say, or be seen in the picture. I will say Peak Color. Captivating – her art is restful and beautiful. either of the birch tree prints..love them and even planted one many years ago on my property.. Peak Color would be my favorite. This could be my backyard. I have watched her programs on landscape, and may someday have the courage to try one!! I love Front Porch. It would look great over my mantle. Oh man. I love them all but Peak Color is my favorite. I miss fall with white birch trees and the pretty leaves. We don’t get that here in California. They all are beautiful and a wonderful memory of Nancy. Thanks for the opportunity to win the note cards. Peak Color is my favorite because I love autumn and birches. I love these! It’s hard to pick a favorite. I do love the trees because the one time I got to meet Nancy she gave a lecture on landscape quilting. Before that, I’d thought that was something I’d never do, but after her lecture, she made it come to life. I miss her so much! Peak Color is my favorite one. The colors are so lovely. Unfair question…LOL. All gorgeous. Nancy had a great eye. I would select front porch as it is as friendly and inviting as Nancy and I love summer, yellow and flowers. I’ll have to go with Peak Colors. I could never do anything that beautiful. Nancy was so talented. They are all very appealing but if I would have to choose, it would be Front Porch. I love homes with a front porch! Front Porch! Just beautiful! Thank you! I love all of them, but my favorite would be Out On A Limb. Moon Lit Birches is my favorite. Very lovely. There is just something about “Out on a Limb” that really makes my heart happy. A beautiful creation. Love all of them but am leaning toward Peak Colors. Miss Nancy as we were in school together at Stout. All of them are gorgeous but I am always drawn to birch trees. Wow, I love them all but Out on a Limb is so dramatic and striking. I need to get her book out and try another landscape quilt with her technique again. I love them all, I really like the Peak Colors, Nancy talent just blows me away. She could do and teach almost everything. She will be missed dearly. They are all beautiful. I am drawn to the simplicity of Moonlit Birches. It is remarkable to realize the positive impact one life, one woman, had on so many people she never even met. Can’t pick a favorite…..they all evoke memories. This is just another way Nancy brought color and beauty into my world. What a talent; what a great loss. Moon lit birches. I just adore birch trees. I love them all. If I had to pick a favorite it would be “Peak Color”. I have a love of birch trees, so Moon Lit Birches is my favorite! I really like Peak Colors! Well done Nancy! My favorite is front porch! I love them all, but Moonlight Birches appeals to me the most. I’m reading Nancy’s husband’s book right now, and it amazes me how much Nancy went thru physically and yet it never showed to the public. The other impact his book has had on me was sharing Nancy’s true faith in God! Her strength is so inspiring to me. Peak Color is my favourite. Moon Lit Birches is my favorite. The Front Porch is my favorite. The Peak Colors. Like the turn of leaves in the fall. Peak Color “leaves” me in awe! front porch is my favorite, but they are all lovely. I love trees at all times of the year. However, the Front Porch scene really grabbed me as it reminded me of some of my fondest childhood memories with people I knew who are no longer with us. I love all of the art that Nancy has done. My favourite from this group is “Out on a Limb”. It reminds me of the apple trees in bloom in springtime at our country place. The blossoms remind me that life continues, and make me very happy. I have always admired Nancy’s ideas and projects, and the way she taught us. I am so glad the journey continues with Nancy Zieman Productions. I like them all but am pulled to the front porch scene. It looks like coming home to a loving family. I think Out On A Limb is my favorite but I love them all. I love the birch trees print but I love them all!